After arriving in Hawai`i in 1870 at age seven, Frear attended Oahu College (Punahou School). Having received degrees from Yale and Yale Law School, he returned to Hawai`i permanently and began a law practice. Frear held judgeships under both the monarchy and the subsequent governments, was appointed to the First Circuit Court by Queen Lili`uokalani in 1893, and then to the Supreme Court of the Provisional Government by President Dole. Frear was reappointed by Dole to the Supreme Court of the Republic of Hawai`i, a position he held until 1907. Frear helped clarify the legal status of the Islands, working on a commission appointed by President McKinley to recommend legislation concerning Hawai`i. 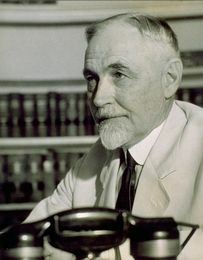 Through this commission, Frear pushed for Territorial status and was instrumental in drafting the Organic Act which established Hawai`i as a United States territory. As Chairman of the Code Commission, from 1903 to 1905 Frear oversaw the compilation, revision and annotation of the complete Laws of Hawai`i. During 1923-1925, another commission updated the Laws with Frear's participation. President Theodore Roosevelt appointed Frear territorial governor in 1907. He served until 1913 after which he resumed his private law practice. From 1925 to 1934 he was president of Bishop Trust Company, continuing as vice president and director until his death in 1948.